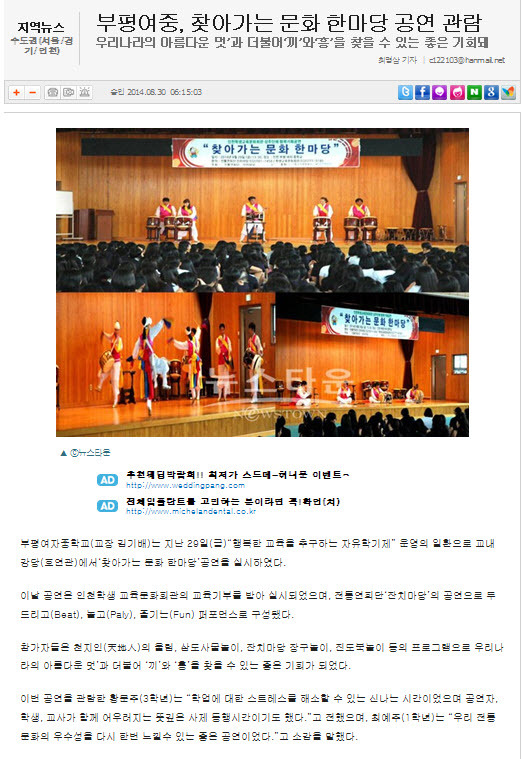 Bupyeong girls' middle school (principal: Kim, Ki-bae) had '찾아가는 문화 한마당' concert at Hoyeongwan assembly hall as a part of 'Autonomic Semesters For Happy Education' program. The performance was supported by the contribution of education from Incheon Educational and Cultural Center for Students, and consists of Beat, Play and Fun, performed by the traditional arts group, Janchimadang. Through the programs such as Modeumbuk Nanta(천지인의 울림), Samdo Samulnori, Janchimadang Janggus and Jindo Buknori(buk drums), participants had a good opportunity to feel the 'beauty', 'talent' and 'joy' of our country. One of the student audience, Munju Hwang (senior) said 'It was an exciting time to relieve academic stress. And the performers, students and teachers had great time, being together'. Yeju Choi (freshman) said 'It was a great performance from which I could feel the superiority of our traditional culture'.